The Le Mans start feature has now been added to the game. This was planned for two reasons: (1) it's cool, and (2) it introduces new players to the controls and appearance of the driver up front instead of being surprised by the driver when you lose (or eject) all your wheels in the middle of a race. Le Mans starts were abolished in most racing types decades ago due to safety reasons of drivers not buckling up and such... but in the GRITS timeline we have Tesla Shields!!!... so who cares about getting thrown from your car now? -- not currently a planned mechanic for this game but, well, hmmmmmmmmmmm............... it probably should be. Let's say v1.1 for now. The black cars are AI cars. Not sure yet when/if their AI controllers will be given logic for running them to their cars as well. 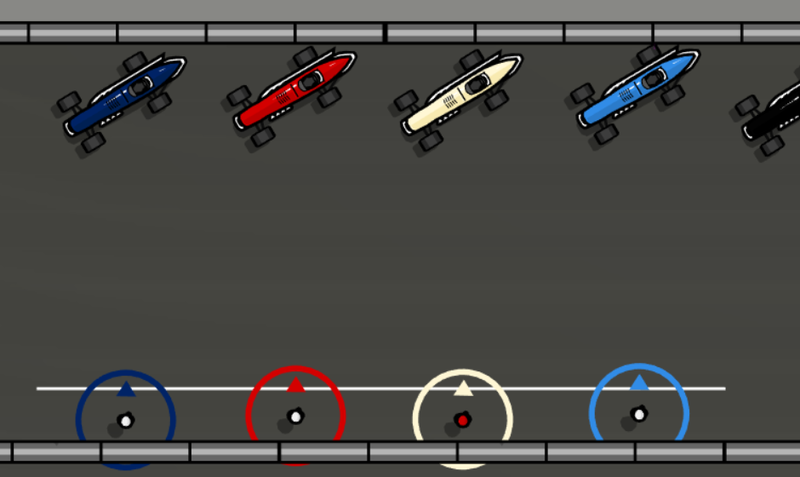 First step will be to just get the AI cars working without Le Mans starting them. It may be a simple AI for Le Mans starting them because it's not likely anyone will be able to outrun them enough to mess with them... but, we'll see where that lands. I'm just not sure I want the AI drivers on foot ever.